2. 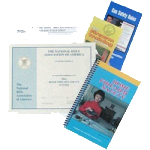 We go the extra mile as each course participant will receive frame quality MSP Course Completion and NRA Certified Home Firearm Safety Certificates, Hard Bound Home Firearm Safety Course Book, and Full Text of Current “MD SENATE BILL 281 Firearm Safety Act of 2013” on CD. Instruction on safety shall be integrated into every phase of the training. Participants shall receive a Firearms Safety Training Certificate issued by the Certified Qualified Handgun Instructor. The submission of the Firearms Safety Training Certificate shall constitute proof that the applicant satisfactorily completed a Firearms Safety Training Course. If you already own a handgun or assault weapon prior to October 1, 2013, you meet the “Training Exempt” status and are not required to complete the training to apply for the Handgun Qualification License. You do, however, need to apply for an HQL, according to the MDSP application requirements. Payment for your HQL permit is payable the MSP via their website using VISA/MC, within 30-days of the Livescan fingerprinting expiration date. Or as a valued added service IOTA will include the MSP HQL permit fee $50 during the application process with no additional upcharge to the permit fee. You can save “approximately” an additional 3% in credit card transaction fees. Remittance of the course fee may be conducted using one of the following forms of payment: personal check, money order, or debit/credit card (online/phone). After receipt of payment, you will be registered for this course. Registration fees are non-refundable. Credit may be applied towards any future course or service of the same value offered by IOTA Firearms and Security Training Academy, Inc., within a 4-month period. Register by personal check or money order payable to IOTA and mail to: PO Box 120, Woodstock, MD 21163. Mailed payments are to be received 3 days prior to the course date. For details about the Handgun Qualification License, who should apply and how to apply, refer here.